Commencement on the €14 million project began in late June 2016 and was aimed to be finished on February 28th, 2017, but now is estimated to be completed sometime in March. The new four storey space will replace what was once was the Old Bar and Spar and include new venue spaces for student events and social activities, increased meeting room provision for clubs and societies, and new student support and SU spaces. 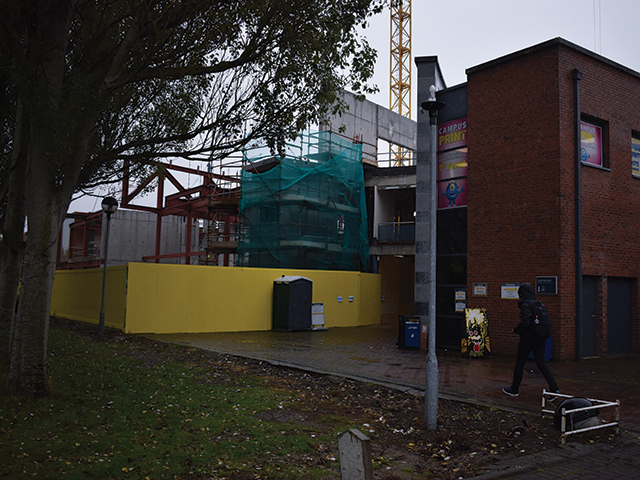 During construction, Spar has been relocated to The Venue, previously used for DCU club and societies events, causing a need for alternative venues both on and off campus in the previous and upcoming year. DCUfm studios have also been relocated to the Student’s Union, which can be a bit “daunting” to first years, according to DCUfm Station Manager Jack Matthews, but “everybody has to make compromises for the big build, so it’s all right”. Matthews said while the DCUfm team–who previously met in the SU meeting rooms that have been replaced temporarily by SU offices–has been meeting in the current fm studio, he does not know what the team will do once broadcasting begins. “When we do start broadcasting it’s going to become difficult to just like hold meetings if we want to meet up with people we are going to have to start booking rooms a bit more often which is a nightmare,” said Matthews. “It will be great when it’s done and I suppose that’s what we have been saying to students, I know it’s an inconvenience and we were very well aware of that before we started, we’ve tried to minimise that as much as possible, but you can’t knock half a building and rebuild an entirely splendid new building without there being some bit of inconvenience”.